As part of a healthful diet, walnuts provide protein, antioxidants, essential vitamins, and minerals. 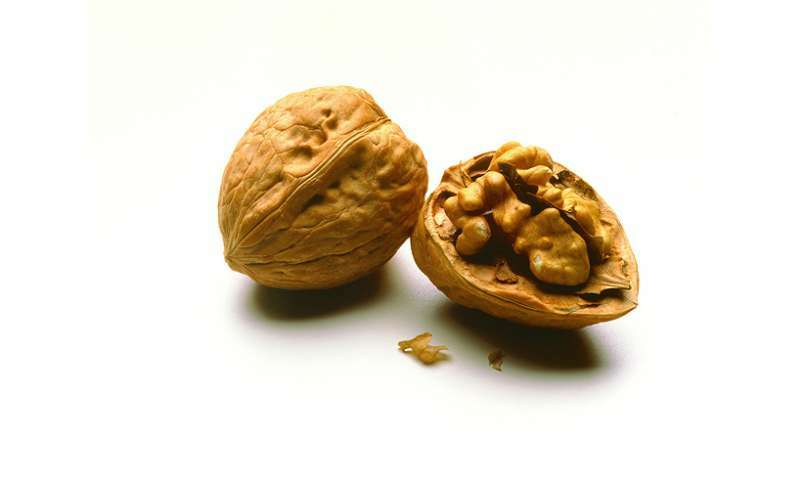 Walnuts are also a good source of omega-3 fatty acids, which are associated with overall good health. However, before walnuts reach your grocery store, they must be harvested, washed, dehulled (hulls removed from shells), and dried. These processes use a lot of energy. Agricultural Research Service (ARS) scientists in Albany, California, have developed a method to improve walnut processing, particularly drying, to reduce energy and obtain high-quality walnut products. 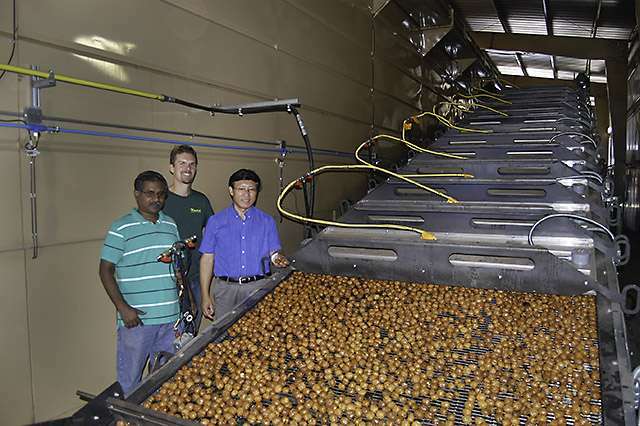 California produces 99 percent of U.S. walnuts—about 570,000 tons per year, says engineer Zhongli Pan, who is in ARS's Healthy Processed Foods Research Unit in Albany. Drying walnuts with hot air takes more than 24 hours and uses a significant amount of natural gas and electricity. "The current hot-air drying method is very slow and not efficient," Pan says. "We knew that infrared had a higher energy transfer rate and could dry walnuts faster, giving us an opportunity to improve the process." Infrared is a type of electromagnetic radiation, as are radio waves, ultraviolet radiation, x rays, and microwaves. Infrared is a form of light that we cannot see—but we can feel its heat on our skin. 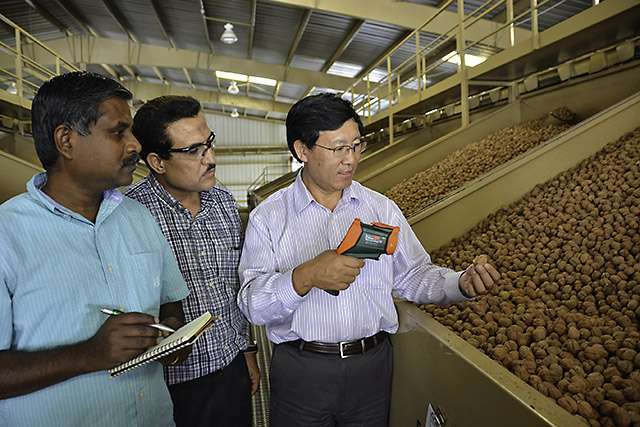 Pan and his research team discovered that up to 25 percent of the energy used to dry walnuts could be saved by pre-drying them with infrared heat, followed by regular hot-air drying. After washing, walnuts have a broad range of moisture content, says Pan, but currently they are hot-air dried for the same amount of time. This can cause underdrying or overdrying. "If the moisture content is too high, it will cause mold," Pan says, "so facilities tend to overdry walnuts to make sure they are safe to consume." Overdrying wastes a lot of energy and reduces walnut quality. The new infrared-drying process quickly removes moisture from the surface of walnuts, which shortens total drying time by 35 percent. It reduces overdrying and underdrying and allows the walnuts inside the shells to maintain their color and exceptional polyunsaturated fat content. Says Pan, "The good thing is that we reduced the surface moisture content of walnuts quickly," which prevents the moisture from moving into the walnut. "It not only saves energy, but it's a safer and better way to dry walnuts." This new technology may also be feasible for other types of nuts, such as pistachios.